This theory implies that such affairs inevitably end in one of two ways: either the mistress is cast aside, or she comes to replace the wife. Acts of Infidelity depicts poet and essayist Ester Nilsson as she endeavors to reorient the life of married actor Olof Sten so that she becomes its center. The novel underscores the inherent power imbalance in Ester’s situation: for all her stratagems and schemes, the question of whether she will become a more permanent fixture in Olof’s life is his to answer. Ester’s difficulties identifying Olof’s true feelings are compounded by the fact that he has his own distinct relationship to language: like the actor he is, Olof “believed that reality was created through statements.” He insists on calibrating his utterances in order to minimize his own culpability in the affair, speaking so that “an imagined audience would find it plausible that what had happened between him and Ester Nilsson was an accident in which he was barely involved.” Having invited her to the apartment with the separated beds, he shows her to the guest bedroom, saying, “Sleep well, Ester. If you get lonely, you can join me.” At one point, he sends her a blank text message — an act that exemplifies his desire to remain in contact with her without committing himself to anything specific. As these descriptions of Olof’s behavior should imply, Acts of Infidelity powerfully captures the frustration of pursuing someone who wishes neither to commit nor to break things off. 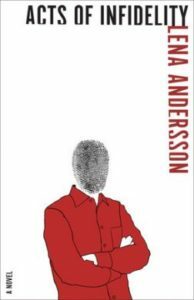 Ester is a captivating protagonist, and her efforts to produce consistently optimistic interpretations for Olof’s inconsistent actions are at once funny and poignant. There’s only one problem with the novel’s psychological realism: Olof himself. The power of Ester’s passion for this man is foundational to the story, but it’s not a passion readers are likely to share. Ester’s claim that they possess uniquely strong physical chemistry is belied by the novel’s underwhelming descriptions: “They lay close together. It was self-evident and needed no discussion”; “A few exceptional minutes of Ester’s life went by…” Even apart from these scenes, Olof does not achieve on the page the level of charm and irresistibility that would justify Ester’s enduring fascination with him. Still, the measure of our dissatisfaction with Olof is also the measure of our sympathies for Ester, as the novel vividly chronicles the emotional havoc he wreaks upon her otherwise logical, well-ordered life. Greg Chase is a writer who lives in Boston. His work has appeared in such forums as Harvard Review Online, Rain Taxi, Guernica, and The Millions. He holds a PhD in English from Boston University and currently teaches at the College of the Holy Cross. To read more of his work, go to gregchasewriting.com.